After Coach Collins’ weekly press conference, Vince Coll and Dan Bartels recap the Owls’ victory over the Navy Midshipmen and look ahead to Temple’s homecoming game against the Cincinnati Bearcats. Colin Mea has more on Navy’s celebration of the start of the Navy. 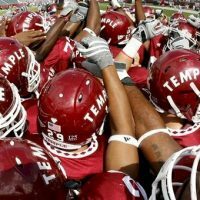 Reporter Jimmy Freas returns to the desk to talk about the versatility of the Temple Football players. Finally, Vince and Dan play “No Huddle”, and close with a look at current standings in the AAC.